he club of the quad-core smartphones is expanding everyday. 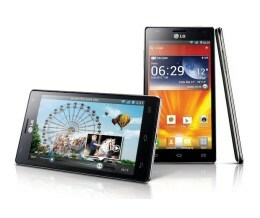 Next in line, right after Samsung Galaxy S3 and HTC One X we got the LG Optimus 4X HD. By design the smartphone follows the line previously imposed by Prada 3.0 and L7. The shape is rectangular with rounded corners and a combination of metal and plastic. The second material is mainly in the back panel and looks a lot like the one we’ve seen a few months ago in Prada. The metal surrounds the periphery in two parallel lines and makes the phone’s appearance massive and luxurius. The weight is 133 grams with the following dimensions – 132.4 mm height, 68.1 mm width and thickness of only 8.9 mm. The color options at the time are just two – black and white, but by the information given by some unofficial sources, we could expect a more suitable for the ladies – deep red. The Optimus 4X HD has a capacitive touchscreen display, using the True HD-IPS LCD technology. It’s 4.7 inches with a 720 x 1280 pixels resolution. It’s covered in Gorilla Glass which is proven to be a great protection against scratches. We were pleasantly surprised to find that the “glass” is not only on display but also along the entire front panel. So, the three buttons below and the light and proximity sensors are also protected. That goes for the additional camera for video calls as well – the image transmitted trough it is with a 1.3 mp equivalent, looks realistic and we didn’t notice any lagging during conversations.